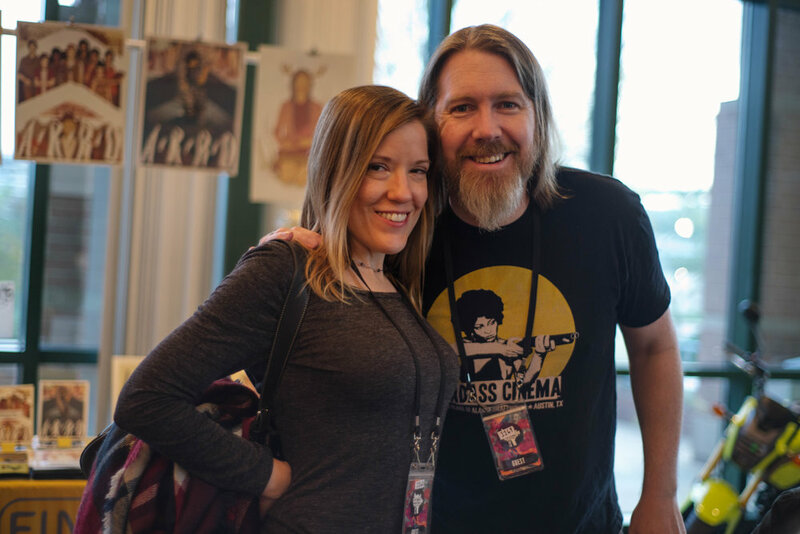 And for Chattanooga Film Festival executive director/lead programmer Chris Dortch, that’s exactly the environment in which to best experience the defiant and anarchic spirit of the films that populate the festival. Blood-soaked horror sits comfortably alongside surreal comedy and heartbreaking drama within the confines of the CFF – which, this year, will take place at a few different venues across downtown Chattanooga. The films themselves can viewed at the Chattanooga Theatre Center, with other events and special guests being announced closer to the start of the festival – which will run from April 11-14 this year. Badges of all sorts and sizes have been announced for CFF. You can head over to their website to get all the details. Based on past years, you can expect film-centric panels, script readings, in-person podcasts and appearances from various directors, actresses and actors throughout the extended weekend. And based on which badge or pass you purchase, you’ll have access to all or some of these events. Dortch is also currently running a fundraiser which would make all CFF classes and workshops free to anyone wanting to attend. These classes benefit upcoming filmmakers, artists and anyone interested in film education. Donations can be made here. We recently had the opportunity to sit down with Dortch to talk about the Chattanooga Film Festival’s “patron saint” Joe Bob Briggs, the struggles in choosing which films to screen and how this year is shaping up to be even crazier than any previous year. Check out our conversation with Dortch below. How have the film submissions compared this year to past years? In October of last year, we were selected as one of MovieMaker Magazine’s 30 Bloody Best Genre Fests in the World. When we were done making sure that this was real and that we weren’t being made sport of by a clever Photoshop savvy prankster, we went over to our film submissions platform at FilmFreeway and noticed that almost overnight the number of films we’d been receiving had increased considerably. That flow has kept up since then and we’re sitting pretty at the highest number of submitted films we’ve received in our history. It’s extremely cool and what is equally cool is the quality of these films. We’re seeing more of the films that in years past we would have had to beg and fight for coming directly to us. This is something that means the world to me. You often cite Joe Bob Briggs as the Patron Saint of the Chattanooga Film Festival. How did your working relationship with him develop? My friendship and CFF’s relationship with Joe Bob began the way a lot of things do for us - with a simple fan letter. One of the upsides to this current “Black Mirror” AF internet society we live in is that we’re all now with social media just a tweet or an email away from a great many of our heroes. I reached out to Joe Bob and told him how much his books, shows and approach to film (and complete lack of pretension) mean to me, and how much he had shaped the vision of what I was hoping to create with CFF. To my eternal surprise he offered to come here and give a talk. He came and our friendship solidified over a pizza at Lupi’s (we’ve gone back almost every year I can grab a quiet moment during the fest), and despite the fact that Joe Bob has been extremely busy with his new show, his work for Shudder and growing number of appearances all over the world, he has always made time for us and for CFF. Honestly I can’t even correctly describe how grateful I am to him for that and what an honor it is to have him as part of our family over the years. What have been some of your favorite screenings over the past 5 years? That’s a very tough question but off the top of my head we did a screening of “Night of the Comet,” a movie that I love an awful lot with star Kelli Maroney and Joe Bob last year that just made my life. Prior to that we had Andre Gower and Ryan Lambert from “The Monster Squad” out, and it was an absolute blast. Then there was the time where Dave Lawson of Rustic Films, and I made everyone who came to see a screening of “The Endless” join a cult before they watched the film. We even fed them tasty lemon-flavored “ascension wafers”. That’s just three examples and at this point. I could fill the pages of a hefty volume with all the incredible memories this festival and the filmmakers and fans that have supported it have given me. Are there any other film festivals you attend to possibly get ideas for CFF? I try to get to as many as I can but with CFF we’re lucky every year if we can even raise the budget to put on the festival itself so I don’t get to travel to other fests as much as I like. I aim to fix that this year and hope to get out to Brooklyn Horror Film Fest, Cinepocalypse, Ithaca Fantastik and a number of other festivals that I’ve been dying to check out that are put on by folks I consider heroes. Also, I’d be remiss if I didn’t mention Fantastic Fest which has my heart. Fantastic Fest and its entire staff have been an endless source of help, inspiration and friendship since CFF began. Attending it is always the best part of my year. Is there a process for choosing which films to screen for the festival? I’m assuming you get a group of friends huddled together in a pillow fort and spend days watching movies and working on a list. That just makes sense to me. Am I close? Though I definitely do ask for second opinions from trusted team members and make a point to ask the programmers and filmmakers I love and respect what they’ve seen and loved lately, the programming of CFF is a pretty solitary thing. Though I’m seriously liking this blanket fort idea you just hit me with. This time of year I spend an absurd amount of time in our CFF office in front of a screen. We’ve got a pretty decent 4k set-up, allowing me to watch the films I’m considering under the best possible conditions. From there the process is a lot like assembling a killer mix-tape. I try to find the coolest films I can. A mix of classics, a few deep cuts that I know movie buffs will appreciate, and then an assortment of the best new films I can wrangle from the festival circuit. I also feel strongly that genre films and a friendliness to them is an important thing for any film festival so we always feature a good cross section of the best genre work from horror to sci-fi to international action that we can. Though it’s an insane and frankly endless process programming, CFF is a serious joy for me every single year. There is always more than a bit of theatricality to CFF’s presentation. In the past, you’ve had big tents, a giant cardboard maze, old-school arcade machines and pop-ups from various local business littering the festival premises. Can we look forward to more of the same this year? Awwwww, bless you for noticing. One of the filmmakers I’ve always admired most was William Castle (the man who gave us “13 Ghosts,” “House on Haunted Hill,” “The Tingler,” etc). Castle didn’t just release his films he found fun and spooky and endlessly inventive ways to make each release special and that sense of showmanship and carnival barker-esque attitude to film exhibition just deeply appeals to me. I want to give folks an experience they couldn’t have at home on their couch with a streaming service if that means I have to bring in puppies after a screening of “White God” or challenge a bunch of genre filmmakers to a Moonpie or hot wing eating contest then I’m good with that. If CFF was a Blu-ray, I’d want it to have an absurd number of special features, and I try to build the whole festival with that in mind. Over the years, you’ve had a number of special guests at CFF, including Elijah Wood, Bobcat Goldthwait and Clint Howard – just to name a few. Are you planning to have some surprise guests this year as well? This year actually (knock on wood) is shaping up to have our largest number of surprise guests. I’m damn proud of how it’s coming together, and I’ll ask you now to join me in crossing your fingers and offering up a prayer for no-whammies that a couple folks we have lined up don’t get busy and wind up not being able to make it. If the Chattanooga Film Festival could be any character in a movie, who would it be and why? Hardest question ever. With the amount of Chattanooga Whiskey we’ve all consumed over the last five years the answer to this question is probably Withnail from “Withnail and I,” but my hope is that we’re sort of a John McClane from “Die Hard” type. Even though we have to walk across broken glass every year to get this festival done we keep at it. Wait can I change my answer to Stallone in “Cobra”? Like I said. Impossible question.